In the 1980's the NatWest bank commissioned Wade to produce a family of five ceramic moneyboxes to encourage young savers to open accounts. Woody, Annabel, Maxwell, Lady Hilary and Sir Nathaniel have since become household names and are very collectable. Thereafter, Wade produced a limited edition of 5,000 Cousin Wesley pigs for NatWest in 1998 as part of a five year savings bond and more recently Wade produced limited editions of 250 gold Woody pigs in 2006, 400 gold Annabel pigs in 2007 and 400 gold Maxwell pigs in 2008. If you like this website let us know or blog using these links or if you have a question about NatWest Pigs use our 'Ask Maxwell' option. Don't let damaged stoppers ruin your NatWest pigs collection !!! 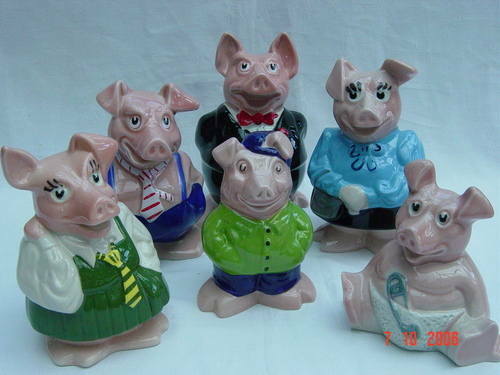 We want to hear about your rare NatWest pigs etc. 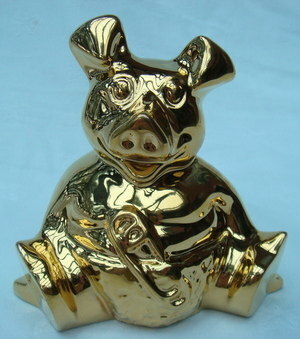 We are always looking to add to our collection if you're interested in selling your rare NatWest pigs etc.